There is something incredibly attractive about combination of trees and shrubs on a lawn, so You should try to grow some in your garden. Trees lend variety to a landscape making it more interesting in addition they provide shade, protect and attract birds to the garden. 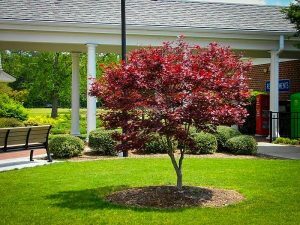 A tree or even a lone bush bedded out on a lawn become the visual center of it and distract attention from the monotonous green space. Another important strong point of trees and shrubs is that, when they strike root they do not need any special care. Perhaps the most difficult thing about choosing a tree is the necessity to decide in favor of one or two cultivars from the myriad of commercially available. Nevertheless, it should be done: one visible from all sides tree looks most impressive. 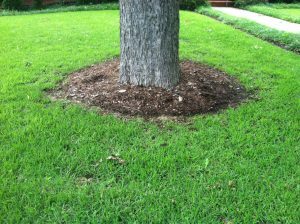 If You still want to bed out several trees it would be much better to allocate them in one compact group and not to scatter them all over the lawn. A lonely tree on a lawn looks quite picturesque, but choosing a suitable location can sometimes be difficult. Please remember carefully that You shouldn’t plant it exactly in the middle of the lawn as it will look unfavorable there. If you don’t plan to arrange the rest of the garden around the chosen tree, it may be better to put the tree near a border. From some coigne of vantage, the house or patio, peer at the lawn and the space behind it. Do you see anything You would prefer to hide? Do the windows of the neighboring house look over your garden? Try to allocate the tree in a way to cover up an undesired view from the window and at the same time to hide You from strangers’ glances. Otherwise, if your garden has picturesque surroundings, two or three properly allocated trees will help to combine your site with the surrounding landscape. But in the city a tree standing on the edge of a lawn creates an illusion of vast landscaped areas hiding behind it, even if your property is situated on a dusty city street. For those areas of the lawn where You want to achieve more natural look, cultivating tall grass, bulbs or wild field flowers, try to avoid using exotic or hybrid trees. Trees and shrubs need to look natural and thus more seamless. For a small lawn You should choose a tree that will look attractive, if not the whole year long, at least most or some of it. It is rather insufficient if the chosen tree has just one decorative feature, such as beautiful blossom, fruitage or autumnal coloring. Chinese sward (Cornuskousa var. chinensis) is an amazing tree, which will delight You with large white flowers at the early summer, with red fruits later and with crimson foliage in autumn. Furthermore, it has a beautiful scaly rind, and expands upward and outward equally well. Many cultivars of crab-apple trees (Malus) blossom very beautifully as well, and later on please an eye with the view of fruits; they are most suitable for planting on small lawns. Trees of Sorbus cashmiriana are small and sprawling with dark green pinnate leaves, white flowers, and later on they yield pink or white berries. Trees with interesting unusual foliage such as acer griseum, northern maple (acer pensylvanicum), paper birch (especially Betula utilis var. jacquemotii) and sakura (Prunus serrula) look great on a lawn as well. 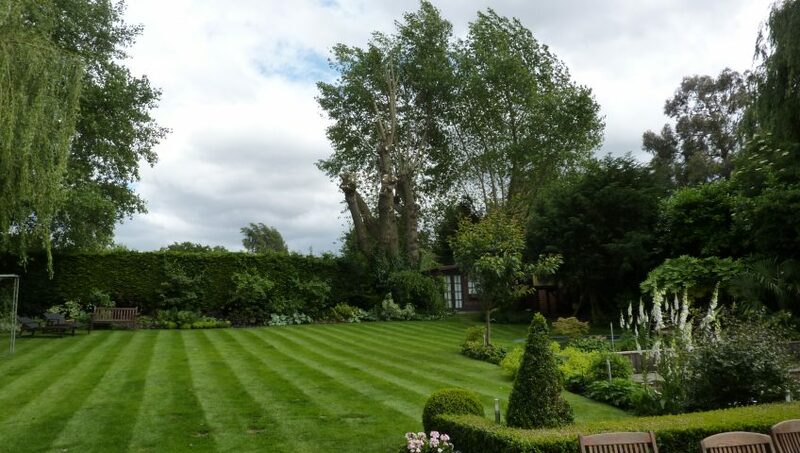 All these trees do not grow too fast, do not have very dense crowns (grass would love it), and they are not too big and therefore are ideal for lawns. There are not many trees that could compare in beauty of autumn leaves with weeping maple (Acer palmatum), when its paw-shaped leaves turn scarlet. Many cultivars of cherry trees (Prunus), such as Okate and Sargent (Prunus sargentii), can also boast a bright autumn foliage and beautiful blossom. To the most space-saving trees could be relevant willow-leaf pear (Pyrus salicfolia) with a round crown, silvery leaves and cream-colored blossom and its weeping sub-type Pendula, and acacia (Robinia pseudoacacia) Umbraculifera with beautiful leaves. Choose these particular cultivar if you want to have a small tree, because other representatives of the species are much larger. Evergreen trees, especially those ones with variegated or golden-yellow foliage, contrasting with grass, also look very impressive on the lawn. Taxus baccata Fastigiata is a straight columnar yew tree with bright yellow foliage. It grows slowly and is well suited for the lawn, as well as Picea pungens Koster – a lovely peg-shaped fir tree with a silver-blue crown. Pinus sylvestris Watereri – is a low, slow-growing pine with hard blue-gray needles and broad crown. You cannot go wrong if you choose for your lawn an evergreen Pittosporum tenuifolium Silver Queen – a space-saving tree with a round crown and a gray-green leaves with a white rim. One of the best evergreen trees is an arbutus x andrachnoides it has beautiful reddish-brown rind, glittering green foliage, white flowers, interesting fruits and stretching up crown. When planning to plant a tree on the lawn, You should remember to cut the grass around the tree trunk and that in autumn the tree will shed its leaves. The problem of cutting the grass could be solved by leaving all bare section of soil around the trunk. Just let it be wide enough to ensure that you will not damage the tree trunk while cutting the grass on the lawn with the mower. At first, whilst the tree is small, you may plant small items around the tree’s base, but as the tree develops it will become too dry for most plants as well as tree foliage will serve as an umbrella blocking all the sunshine. You should choose the plants very carefully, should you still desire to plant them under mature trees. Weeping trees with branches hanging to the ground, such as the weeping birch or cherry, growing alone on a lawn, look very graceful and very popular. However, due to their shape, they create a very dense shade, which, of course, adversely affects the grass growing under them. Trees with a lightsome openwork foliage are ideal for planting as subordinate crop since they permit light through in a proper way. Himalayan birch (Betula utilis var. jacquermontii) is especially good for this, as it has small-size and sparse foliage. However, most of the trees give a deep shadow, and therefore the choice of plants for planting beneath them is limited. The most reasonable decision in this case is planting spring bulbous cultivars, which are able to grow up and finish blossoming before dense foliage is being formed on the tree. Shade-demanding ground-cover plants feel very comfortably under such trees as well. 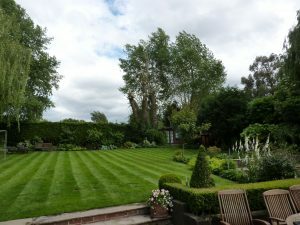 If you grow evergreen trees on your lawn, it is likely that you’ll have to confine them to their own decorative effect. You should not plant any bushes or large plants under a lonely tree growing on a lawn, as they will merge and distort the silhouette of the trunk of the tree, but different climbers would just decorate it. However, You should keep in mind that too strong and viable climbing plant can strangle a small tree and You should take that into account, while making decision. Birthroot or wake robin also known as trillium. Indian cress or nasturtium also known as tropaeolum majus. If You do not have enough space on your lawn for a tree, plant a bush, or maybe even two or three. Some bushes are stretching upwards and, if properly cut, will look like a tree with multiple trunks. A lawn is a perfect place to plant your favorite bush, so you’ll be able to admire it from all sides, and it will not have to fight with its neighbors for light, water and nourishment. The same advantages and disadvantages are inherent for shrubs growing on lawns as for trees, with the only difference that they don’t have clear-cut trunks, which means that the foliage is much lower and grass suffers more from it. Two main problems you may encounter: grass can grow too high, because you will not be able to approach it with the mower, or it might simply perish in the dense shade. In the first case, a simple scissors could solve your problem. And in the second You’ll have to clean up around the bush trunk and either make it increasingly wider as the bush grows, or regularly cut the bush to keep it in the same boundaries. You should make the choice with due account to the type of shrub and its immunity to frequent pruning. Arrowwood or viburnum, or white-rod, or guilder rose, or white hazel tree also known as raisin folded Mariesii. The best time for planting shrubs or trees is the period between spring and autumn and in some milder European countries may plant in winter though saplings can get damaged by sudden and prolonged frosts. Ornamental plants and bushes need other fertilizers, than lawn grass requires, so they should be fed separately. Grass requires fertilizers with a high nitrogen level for healthy and beautiful leaves, but for trees and shrubs such fertilizer also stimulates the growth of leaves at the expense of flowers and fruit. They need a balanced fertilizer with equal doses of nitrogen, potassium and phosphorus, but if they are going to blossom or the fruits are kerning on them a fertilizer should have increased level of potassium. You should put the fertilizer into the ground around the trunk using manure fork and irrigate it properly in a way that water would reach the root zone. Remove all the weeds from the area under the tree or bush. If a fruit tree is growing on your lawn, You should either leave a wider clear space around the tree trunk or not fertilize the grass around the tree, otherwise you will soon discover that the tree bears much fewer flowers and fruits. Putrefying leaves emit a lot of heat, so they should be removed from the lawn in autumn, as soon as they fall off. Collect the leaves into compost piles. Leaves will gradually turn into leaf mold – an excellent soil conditioner for a garden. Leaves should be kept in those bags for at least six months, so put them somewhere away. Before storing, you should soak the leaves properly to aid decomposition. Dig a planting pit in the soil about 1,2 meters in diameter. It must be at least four times wider than the diameter of the pot in which the tree grows or a soil clod surrounding the roots. First, remove the greensward and fold it in a stack, and then put the soil dug out from the pit in a wheelbarrow or on a sheet of plastic, not to spoil the lawn. The hole should be about one and a half times deeper than the pot. If the compost around the roots is completely dry, submerse the pot in a bucket of water to moisten it through. Put some garden compost or any other organic fertilizer (for example, a couple of buckets of good humus manure) at the bottom of the dug pit. Inter-fuse it with the soil using a manure fork. Put some organics in the soil taken from the pit as well, as a tree should be planted not just into the garden soil, but in a moisture well-retentive soil mixture. If the roots of the tree have completely filled the pot, stir them up a bit. Put the tree or shrub in the center of the pit so that the root clod would be placed at the ground level; add to the bottom some compost-soil mixture, if necessary. Fill the pit with soil and compost, tamping it carefully. You should prop up trees with pegs for the first two years after planting them unless and until they take root well. Be careful not to damage the roots, hammer a peg into the ground at height of 1-1,2 meters over the soil level and at an angle of 45 ° to the ground, and close enough to the tree to snap it to the trunk. The top of the peg should be directed toward the prevailing wind. You should irrigate the tree or the bush abundantly – at least 2-3 buckets of water.